After five weeks, I've just finished Kettlercise for Women Volume 2, and I have to say I'm quite pleased with it. It was definitely a step up from volume 1, but not as far as Lean In 14, so it fits the bill perfectly. I'm a lot more likely to use it again than I am volume 1 - not that volume 1 wasn't any good, because it was, but by comparison it's definitely more of a starting point. It is, basically, what you would expect from volume 1, and the same goes for volume 2. Even after those five weeks, I was still struggling. It only got easier in terms of becoming familiar enough with the moves to do them with good form, but they certainly remained a challenge. Reverse wood chops with a kettlebell - that's never going to be easy. 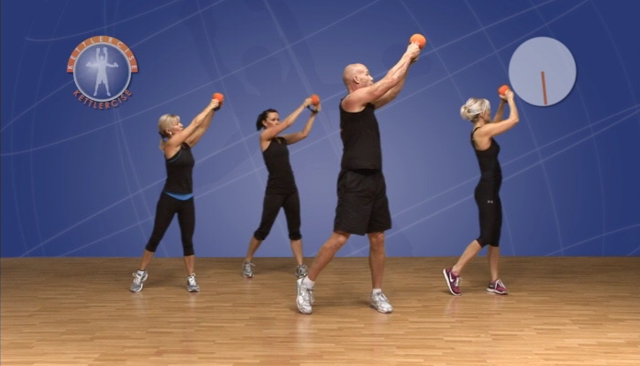 That move, along with a handful of others, were new to me, and they were present in both the 20 minute express workout and the 50 minute full program, while the latter also involved many more familiar moves. For example, there are no windmills in the express program, but there are two sets (weight in the top hand and weight in the bottom hand) of windmills in the full program. The workout was tough, but it certainly sculpts and the range of compound moves really engages your whole body, provides the cardio you expect from kettlebells, and gives you a great sweat. I did use the express program (17 minutes minus warm up and cool down, so I added on 3 minutes with Turkish get-ups and windmills) three days a week and supplemented it with Kukuwa, and I used Pound on the in between days, and I kept the full program (only actually 36 minutes minus warm up and cool down, so I added 4 minutes with other moves again) for Saturday when I had more time. Don't be fooled by 'express', though. It's shorter than the full program, but it definitely still delivers, and by supplementing it with cardio afterwards, your body is already in fat-burning mode and you give yourself a 'break' by simply moving on to something different. It keeps you from getting bored or phoning it in, which is easy to do if you have a long workout of the same activity, like the full program. I would definitely recommend this DVD, but to be honest, I would say you should use volume 1 first. You'll appreciate it more this way, and you'll already be familiar with basic form. Plus, if you're new to kettlebells, Kettlercise for Women Volume 1 is genuinely a great starting point. It provides a 20 minute 'express' program and a longer full program, but they're made up of simpler (but certainly still effective) moves that will really help you find your footing with the kit, but both volumes do have an 'instructional' program that takes you through how kettlebells work and general form, which makes it even better for kettlebell beginners. I do intend to write a DVD review, but I've been a bit distracted lately so I wouldn't be surprised if it slipped my mind, but suffice it to say that it will go more or less the same way as my review for volume 1, the only difference being the addition of 'it's the perfect next level'.